I was on my way to Pittsburgh, midair, when this ad resulted in my producing a slight “awk.” I have three problems with this AirTran ad — two of which deal with hyphens. 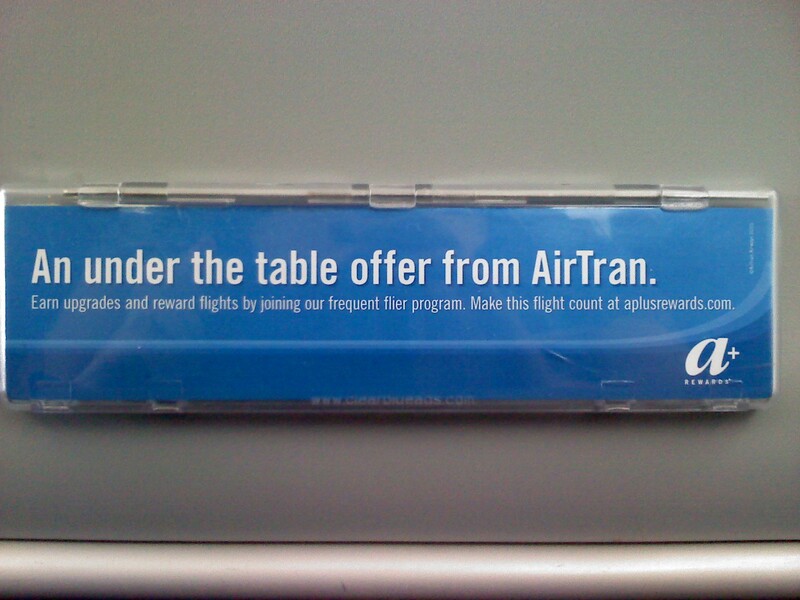 First of all, I don’t like that a period sits at the end of “An under the table offer from AirTran.” The poor period is frozen there, highly embarrassed and hoping no one will notice it, for it should not be there. Periods come at the ends of sentences, and the phrase after which the period lies is, well, just a noun phrase. What comes before the period does not have a subject and a verb, so removing it would save the poor thing much humiliation. Let’s move on to the two hyphen misuses. The first glaring discretion is “under the table offer.” The words under the table are working together to describe offer. What kind of offer is it? An under-the-table offer! Look at those hyphens — just look at them! They bind the words together as a power adjective that describes offer. Hyphens can be tricky, though, because they are often placed as adjectives that come before nouns — but not after. If I were to say, for example, “That offer was under the table,” I would not use hyphens. It’s kind of annoying, I know. The last mistake also deals with hyphens. It’s in the teeny, tiny sentence under the title. Again, we have more than one word working as an adjective to describe a noun. Did you find it? I’ll give you a hint; it’s–oh, what the heck, I’ll just tell you. “Frequent flier program” doesn’t work for me. Again, we need a hyphen to join words, this time frequent and flier. What kind of program is it? A frequent-flier program! Michelle. In “I have three problems with this AirTran ad–two of which deal with hyphens.” and “The crowd goes wild–hyphens save the day again!” wouldn’t it be clearer with a space on either side of the “-“, or with a comma in the first and a colon with the second? Just wondering. My initial reaction was to read them as hyphenated words rather than as a dash. Incidentally, I came to your blog via this morning’s OED re-tweet. I like it. I’ve gone through all my posts and fixed the hyphen-dash hybrids. I’m very grateful you pointed that out. I know in the grand scheme of life, a more-readable dash probably doesn’t compare, but that’s what editing (and what I do) is all about. Again, thank you for that suggestion.